If you were to mention ‘Singapore sharks’ to the average person on the street, the most likely response that you would get would be ‘…fin soup’. And then, depending on the environmental awareness of the respondent, either a heavy sigh or a licking of the lips. However, few Singaporeans know that Singapore has real live sharks, and I’m not talking about the sort that live in aquariums or work in the financial industry. Sharks have gotten a bad (but inaccurate) reputation in popular media that depicts them as savage and ruthless hunters of humans. Jaws set the stage for this misunderstanding, but recent movies such as Meg have reinforced this perception. This depiction, however, is far from the truth. Sharks live in Singapore’s waters and Hantu divers even swim with them from time to time. 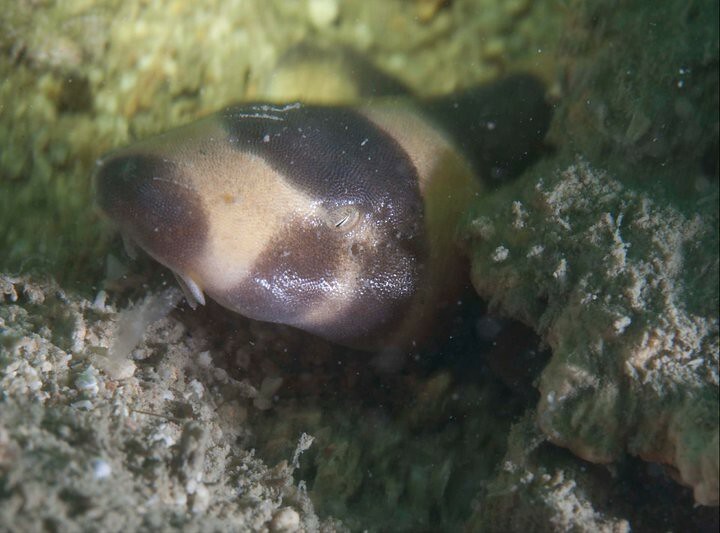 The most common sharks that are seen in Singapore’s waters come from the bamboo shark family (Hemiscylliidae) and a cute specimen was photographed on the Hantu reef during the 7th anniversary dive on Mar 2011. 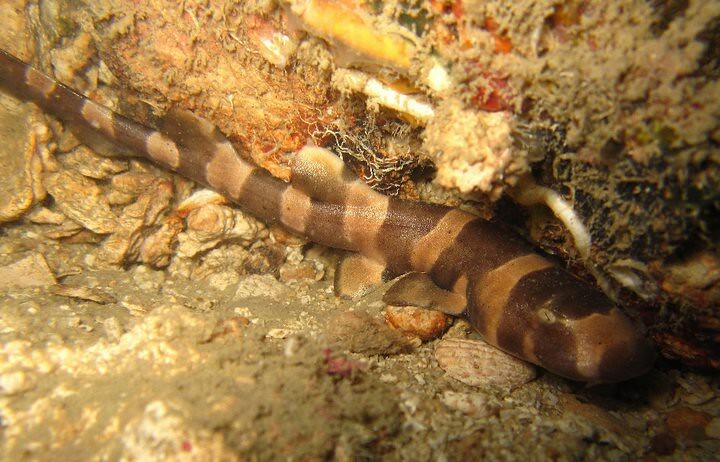 A brownbanded bamboo shark from the Hantu reef. The barbels (short pointy things) on the chin of these sharks earned them the nickname of ‘cat shark’ and, in my opinion, the adorable face and narrow pupils provide strong support for that nickname. Another specimen was sighted 3 months later by Cindy Tan with a better perspective of its whole body. 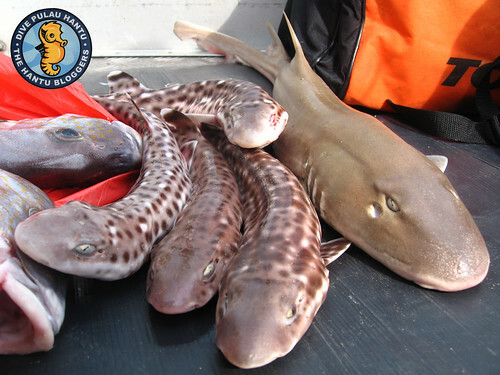 To further our knowledge of bamboo sharks, Dr Neil Hutchinson from James Cook University Singapore has been working on tagging bamboo sharks in Singapore to find out more about them (if you do spot one you can tell him about it here). As it stands, what scientists already know about them is fascinating. Like other sharks, bamboo sharks are capable of electroreception that allows them to detect and capture prey in the water. More interestingly, baby bamboo sharks have been found to detect electronic impulses from potential predators while they are still in their eggs. The baby sharks then temporarily stop their gill movements to reduce the chances of their egg being found and eaten by predators. On top that, some bamboo sharks were trained by researchers to complete visual tests for food and they were found to be able to complete the same test after a 50 week break! This suggests that some bamboo sharks have memories that can last over a year. Bamboo sharks were also sighted on the Hantu reef in 2013. But Singapore’s waters don’t just play host to bamboo sharks.During the course of his research, Dr Hutchinson has also come across coral catsharks and black tip reef sharks. Unfortunately, some of these sharks do end up as the catch of local fisherpeople. 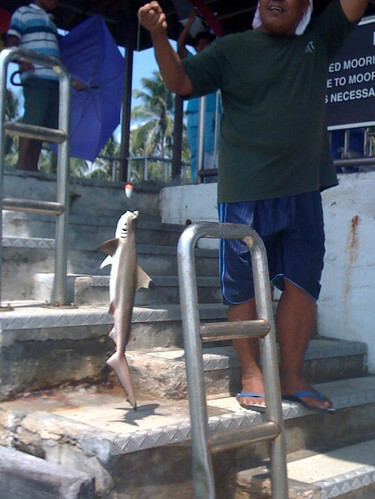 In 2009, the Hantu blog spotted a local fisherman pulling up a black tip reef shark. A fisherman’s catch over one night in Singapore reefs just off Pulau Hantu. Kathy founded The Dorsal Effect in 2013 to advance shark protection in the region! The Dorsal Effect offers shark fisherpeople the opportunity to take up ecotourism instead. It is clear that more has to be done to protect sharks in Singapore and the waters beyond and this begins with consumer education and awareness. Declining shark fin at restaurants and events helps ensure that the fins stay in the water, attached to sharks! Stronger policy and regulation of the shark fin trade would also extend greater protection to the fine fishes. Finally, more research on the sharks in Singapore’s waters is also necessary so that we know what lives in the waters around us. After all, it is impossible to protect what we don’t know exists!